MCLEAN, VA--(Marketwired - Mar 1, 2018) - Freddie Mac (OTCQB: FMCC) today released the results of its Primary Mortgage Market Survey® (PMMS®), showing the 30-year fixed mortgage rate increasing for the eighth-consecutive week. 30-year fixed-rate mortgage (FRM) averaged 4.43 percent with an average 0.5 point for the week ending March 1, 2018, up from last week when it averaged 4.40 percent. A year ago at this time, the 30-year FRM averaged 4.10 percent. 15-year FRM this week averaged 3.90 percent with an average 0.5 point, up from last week when it averaged 3.85 percent. A year ago at this time, the 15-year FRM averaged 3.32 percent. 5-year Treasury-indexed hybrid adjustable-rate mortgage (ARM) averaged 3.62 percent this week with an average 0.4 point, down slightly from last week when it averaged 3.65. A year ago at this time, the 5-year ARM averaged 3.14 percent. "Optimistic testimony on Capitol Hill from Federal Reserve Chairman Jerome Powell sent Treasury yields higher as Powell stated his outlook for the economy has strengthened since December. 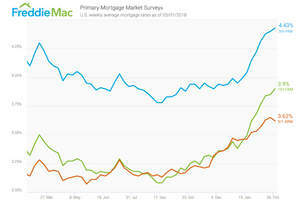 Following Treasurys, the 30-year fixed mortgage rate jumped 3 basis points to reach 4.43 percent in this week's survey. The 30-year rate has been on a tear in 2018, climbing 48 basis points since the start of the year and increasing for 8 consecutive weeks. "As we documented, historically when mortgage rates surge, housing swoons. But we think strength in the economy and pent up housing demand should allow U.S. housing markets to post modest growth this year even with higher mortgage rates. We really have to wait for housing markets to heat up in spring, but early indications are that housing demand remains robust to these rate increases. The MBA reported in their latest weekly applications survey that home purchase mortgage originations were up 3 percent from a year ago"